Hatters’ duo Danny Spiller and Simon Ainge have both left the club after their contracts were terminated with immediate effect. 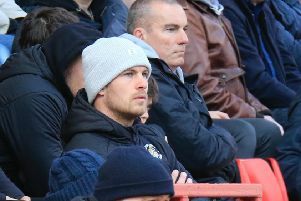 Spiller, 31, has endured a torrid time since joining Kenilworth Road on a free transfer from Gillingham last summer, as injury problems meant he never featured for the club in a competitive game. Meanwhile, Ainge signed on loan from Conference North side Guiseley in September, before making his move permanent. He made 27 appearances, scoring twice, but was made available for transfer at the end of last term, although had reported back for pre-season training on Monday.